A new grounding connector from Tyco Electronics shortens the installation time of a ground wire to a solar panel frame. The threaded connector inserts through a hole in the frame and uses two hex nuts to help provide a reliable connection. The connector handles 6 and 8 AWG (13.3 and 8.4 mm2) solid, uninsulated copper wire. 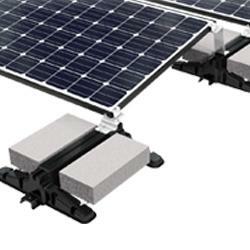 An accessory for the proven SOLARLOK brand of solar cable connectors, the new connector latch locking collar can be applied to mated connectors to prevent inadvertent or accidental unmating. The collar locks over the mated connection to prevent access to the release mechanism of the mated connectors. The collar allows tooled extraction, requiring only a screwdriver to be inserted into a slot in the collar for release. Investorideas.com Green Investor News - Looking for the Green "Google"
The "Emerald Home" has achieved a net-zero designation and corresponding H.E.R.S. (Home Energy Rating System) score of "minus two," two points less than the magic number of "zero" as called for in Ed Mazria's "2030 Challenge." The latest figures released yesterday by the Energy Information Administration (EIA) in its "Electric Power Monthly" report, confirm the continued growth of renewable energy in the electrical generation sector. REHAU has provided the complete radiant heating system for Virginia Tech's "LUMENHAUS" entry into the U.S. Dept. of Energy's 2009 Solar Decathlon. SGS Wind Energy Services has recently added to its portfolio comprehensive occupational Health, Safety, Security, and Environmental auditing services (HSSE), including Legal Mapping and Risk Management Advisory Services for offshore wind farms. United States Wind Turbine Manufacturers offered free demonstration VENTUS cold climate anemometer. This unit is ideal for turbine control in harsh freezing environments.